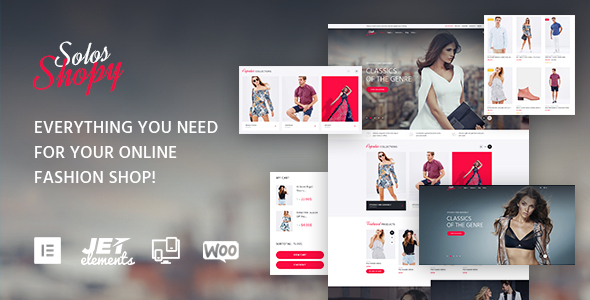 Solos Shopy is a good-looking fashion WooCommerce theme, which was designed by top industry leaders to help you amplify all fashion ideas on the web! It is bright and captivating, and has a stylish look that will make your clients click the siteâ€™s link over and over again. This fashion store WooCommerce theme boasts a fully responsive and a truly elegant website slider on the homepage. So, you can create a great showcase of new collections and hot deals. Moreover, Solos Shopy has everything to highlight your womenâ€™s fashion goods. For example, star rating, crossed pricing, a neat product carousel, and a variety of product badges will make your fashion clothes and accessories look far more admirable for customers. Solos Shopy comes with a must-have Wishlist & Compare plugin and allows your clients to enjoy a simple checkout process. Therefore, your visitors can lay aside favorite fashion products and compare them the way they like as well as they can pay for the purchase without driving them nuts. This fashion shop theme is pre-loaded with a newsletter subscription and a variety of social options. So, your clients can easily get all new offers & promos right in the inbox and share their shopping experience on social media! Meet your real sales booster with this fashion & beauty WooCommerce theme!